If you want speed and style, it is worth checking out the new MotoRazr V3xx multimedia mobile phone. The stylish new MOTORAZR V3xx delvers high speed connectively and dynamic media capabilities. Measuring in at 14.9 millimeters, this model is also Motorola’s thinnest High Speed Downlink Packet Access (HSDPA) handset and it comes with EDGE technology. With these new technologies, users can browse net, download the latest music videos, catch up on news or check out a favorite television show through live streaming content, transmitted over the air at broadband-like speed to the phone’s 2.2-inch color screen. Besides, it is also allows users to conduct two-way video calls at 15 frames per second. 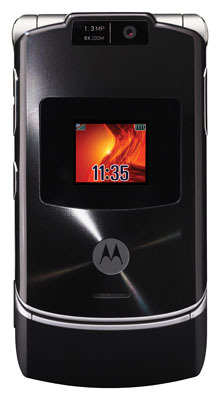 Aesthetically, MotoRaz V3xx clamshell phone comes with a premium metal finish and precision cut keypad. Modeled after the award-winning MotoRazr design, the V3xx can displays 256,000 colours with its 2.2-in internal screen. For music fans, the phone also includes an integrated music player and Bluetooth stereo music profiles for streaming music to compatible Bluetooth-enabled wireless stereo headphones. If pictures or video recording is your consideration, the V3xx comes with a 1.3-megapixel camera. Files are stored on a microSD card. 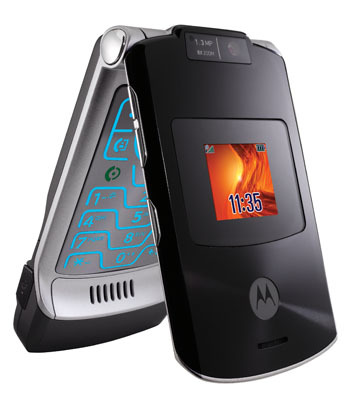 Other selling point of this Motorola phone is the PC compatibility, the phone comes with a USB cable and software disc so users can link it to PC and sync all contacts and calendar entries with Microsoft outlook express. Users can do editing in the PC such adding and deleting music, picture and videos as well as using keyboard to send text messages! The retail price is about US$400.